So you have a young oboist in your midst? That’s fantastic! But as a parent, you might be feeling a bit like a walking ATM. Between the Band Director insisting the student take lessons, a never-ending search for oboe reeds that work, an instrument that is a great deal more expensive than most, sheet music, essential supplies and not to mention chauffeuring the budding musician around; a parent will occasionally reach a breaking point when it comes to the mere mention of more equipment to purchase. How long will it take before they are making their own reeds? Let’s deal with the biggest question that comes to mind: Cost. Oboe reed making kits average between $65 – $200. Prices can vary widely between suppliers and items the kit come with will vary as well. Why such a price difference? Some reed making kits you can purchase from suppliers aren’t really all the items needed to truly make reeds. Some kits are really just reed “adjustment” kits. You can purchase a reed adjustment kit (which will be the cheapest) but in order to actually make a reed from raw pieces of cane to finished reed will require more tools than this. Fewer tools means less cost. This can be a confusing or frustrating moment for parents because there are many different supply companies, the reed making kits come with varying tools, price range and more. I hope to make the process easier. The items that are mandatory to have are listed here and then I’ll tell you more info about those items below that. Keep in mind there is not a standardized naming system for reed kits when purchasing from suppliers. I’ve named them based mostly on how many tools they contain or how complete they are. So when shopping around, you likely will not find them named in this fashion. Be sure to double-check the items contained in the kit. -The absolute bare bones items you need to have would be a knife, mandrel, plaque, and cutting block. This is more or less an oboe reed adjustment kit. A student is missing several components for the reed making process, but if cost is the issue it may save some money and perhaps the instructor will allow the student to learn scraping the reeds first. -The kit you will see most often will come with the following items: knife, mandrel, plaque, cutting block, ruler, sharpening stone and tool case. I think of it as a standard kit. -A kit with all necessary items is often referred to as a deluxe kit. It will contain all items from the standard kit but the major difference is it will come with cane and staples. That’s right – even if you buy a really nice reed kit with all the appropriate tools, the student won’t be able to make reeds without staples and cane. Sometimes this isn’t such a problem. Your child’s oboe teacher may have cane they are willing to sell at a discount rate or even give them. They can usually use the staples from cracked, unplayable old reeds. Have your child save those old staples! Many oboe reed making supply companies will sell the thread, beeswax and sharpening stone separate, even with the most complete reed making kit. Just be sure to check the mandatory list before placing the order or you may find out you have to place another other for something that was missed. The knife should come presharpened, so you will need to specify whether the student is right or left-handed. Don’t forget to save those old oboe staples from broken reeds! You can absolutely buy these items separately from the supplier but oftentimes it will cost you more to do it that way. It tends to be best to do an internet search for these items as an Oboe Reed Making Kit. This is such a hard question to answer. I’d love to tell parents their child will be making oboe reeds they can play on for themselves by next month but that doesn’t tend to be the case. Reed making is a skill acquired by lots of repetition and hours just like learning to play the instrument. You get out of it what you put into it. Some students really don’t like reed making and their skills will suffer. With my students learning to make reeds, I like to do a collective reed making workshop during the summer. It is intensive and lasts for five days, but they meet my other students and we work on the techniques in a group setting. Usually after the third day of working on the techniques they have something that has the shape of an oboe reed. I found that two years is a pretty good measure for how long students will be working on reed making before the reeds are getting close. Even then, I still work on their reeds for them to make sure they play well and help them hone their skills. Just remember – reed making is a skill like playing the instrument. It takes time and practice. I will be posting more about reed making to help parents (and students) know more about what is involved. Check back for more! 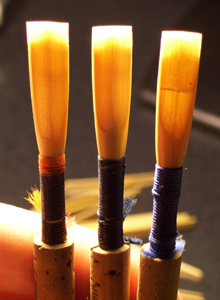 This entry was posted in Education, Oboe Reed Making and tagged double reed, learn reedmaking, learn to make oboe reeds, music, music lessons, oboe, oboe reed making, Reed, reed making, student oboe reed. Bookmark the permalink. Another tip for parents: the price of the kit is meaningless if the equipment is not properly maintained. Most professional oboists agree that the single most important thing in successful reed making is sharp knives…. yes, your children will be playing with dangerous tools, but a dull knife can actually be more dangerous than a keen edge. I personally find that expensive knives are worth it, but others disagree: it becomes a matter of personnal preference. In all cases, technique and equipment for knife sharpening is your best bet. If I may, I would like to recommend the following introduction to knife sharpening. Bear in mind that there are other techniques – whatever your teacher recommends is surely the safest way to go – that’s the one s/he will be able to help you with! Thanks for all the comments Robin! It is a tough choice on an expensive knife or a cheap knife to start with. I usually recommend the cheaper knife first because it helps keep the cost down for the parents and if the students wears the knife unevenly in the process of learning to sharpen, the damage done is less costly to replace. I do know exactly what you mean though. I love my expensive knives and they certainly are worth it!